Tasty chicory greens. They look a bit like dandelions, and prickly lettuce, don’t they? That’s because they are related. The other day, after years frequenting the same rushing creek in southeast Denver, I finally figured out a way across. On the other side, I found chicory. Chicory (Cichorium intybus) is a non-native plant that’s widely naturalized across the U.S. You probably know it from its attractive, daisy-like, purple-blue flowers, many of which are borne along the lengths of seemingly leafless, thin, branching stalks clustered together like a ready-made flower arrangement. The flower heads have ray florets only, with jaggedy teeth at the tips. Chicory often grows along roadsides where it’s not ideal to gather, but on the other side of the creek I was fortunate to find a number of plants hunkered up between rows of willows, where they seemed quite protected from exhaust and other pollutants. Chicory leaves grow in a basal rosette first, and at that stage are similar in appearance to dandelions, to which chicory is related. Like those of dandelions, chicory leaves come in several forms—sometimes fairly rounded and widest near the apex and with few or shallow lobes; and sometimes bearing, deep, backwards-pointed lobes. Chicory, too, produces a milky latex when cut, and like dandelions, can be extremely bitter if you gather the leaves late or under less-than-ideal growing conditions. 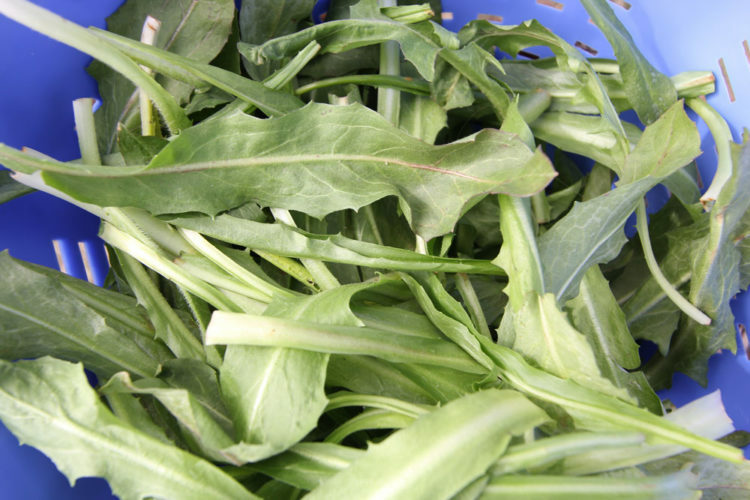 In early spring, however, chicory greens can be quite mild and nice, with just a hint of nutritious bitterness. That was the condition in which I found this recent batch. I picked the young chicory leaves from the center of the cluster. Note the white latex. Here you can see the new greens coming up at the base of the dried, previous-year’s flowering stalks. Once you know what chicory’s dried-out stalks look like, they are easy enough to locate. The dried skeletons can be as tall as 5 feet in height (Seebeck, 2012) and are zig-zagged in appearance, with the remnants of flower bracts along them. A perennial, chicory greens burst forth from the base of these skeletal remains. The greens themselves are often fuzzy and the underside of the leaf midrib hairy—a major factor that distinguishes them from dandelions. But the greens can also be nearly smooth and shiny, even in the same cluster of leaves. I went for the smoother leaves, cutting healthy bunches from the clusters at the base of the prior year’s dried flower stalks. Chicory greens can be hairy, especially on the underside of the midrib, a distinguishing feature from dandelions. Chicory is closely related to endive, which can provide some clues as to how to prepare it. 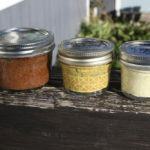 It can also be used interchangeably with dandelion greens according to Katie Letcher Lyle in The Complete Guide to Edible Wild Plants, Mushrooms, Fruits, and Nuts (2010 ed. ), a book I like for its traditional recipes and lore. I used my latest batch for a variation on the “Traditional Dandelion Salad” that Lyle describes, in which moistened greens are pan-wilted in bacon fat and sprinkled with salt, pepper, and vinegar. I put red pepper flakes in mine instead of the recommended hard-boiled eggs, which also sounds good. I think next time I may try a Middle Eastern preparation, something akin to what is described at Green Prophet. Chicory greens in traditional dandelion-style–pan-wilted in bacon fat with vinegar and red pepper flakes. In the meantime I’ve come to the conclusion that no stream-crossing mission should ever be fully abandoned—for who knows what delicious wild edibles lie on the other side? Ha ha thank you so much. A while ago I planted eome seedlings under one of the lemons in a barrel planter and have forgotten all about them except they have regrown from nothing to a vibrant green beautiful plant and later with those beautiful flowers. I thought they may have been Mizuna but niw I know it’s Chikory. Thank you so much.